Stratford-upon-Avon - ideal guide for tourist accommodation, restaurants, country inns, sight-seeing and more. Welcome to Stratford-upon-Avon, the birthplace of William Shakespeare, steeped in culture and history. Set in the beautiful rural Warwickshire countryside, on the banks of the river Avon, it is one of the most important tourist destinations in the UK. With easy road, rail and airport access, it is the perfect place for a vacation or short break. Facilities for conferences and smaller business venues are excellent. Come wander through these Stratford pages, get a taste of Olde England - and make your plans now. Using the Stratford district as a base, you can enjoy the delights not only of Shakespeare's hometown, but also the nearby surrounding shire counties of Oxfordshire, Worcestershire and Gloucestershire. Enjoy Blenheim Palace and the Cotswolds to the south, Worcester and the Malverns to the west, Warwick Castle and Henley in Arden to the north, and all within an hour's journey of Stratford itself. 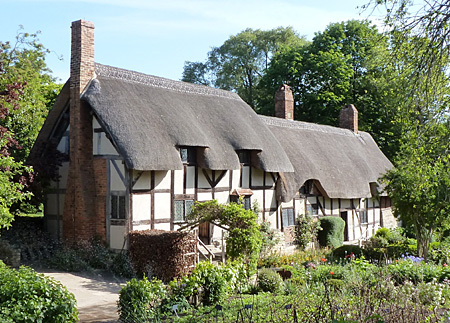 Here you will find hundreds of pages of information on: accommodation, eating out, drinking and relaxing, romantic breaks, theatres, places to visit - Shakespeare's houses and the beautiful Stratford-upon-Avon with its parks and gardens on the banks of the river Avon. Stratford is currently looking forward to a wonderful Winter season. Click below to be able to download the Winter 2016 Season programme and schedule. If you are planning to visit Stratford plan early especially during special occasions. Doctor Faustus, The Alchemist, The Two Noble Kinsmen, The Rover, The Seven Acts of Mercy plus a mixed bag of other entertainments. We are also able to show the advanced programme for Spring/Summer 2017. Celebrating the 2000 year's anniversary of the poet Ovid this season will transport you back to Shakespeare's Rome. Click here for the RSC's Spring/Summer programme for 2017. For theatre goers there is always something showing at the Royal Shakespeare Company (RSC) with a full set of programmes throughout the year and into 2016. Stratford-upon-Avon has a very rich and varied programme of events and activities see our What's On for 2016 throughout the year: theatres, arts, music in the parks, river racing, river cruising, walks along the river or simply relax and take in the atmosphere that is Shakespeare's Stratford. Stratford-upon-Avon is a wonderful place to enjoy throughout the year. - Christmas Lights and Christmas Shopping (2016). Stratford is a delightful town which can easily be walked around and explored on foot or using the hop-on, hop-off bus service operated by the Shakespeare Trust, who manage the five Shakespeare Houses in and around Stratford..